Turrall Fly Pod Zonker Selection, the Zonker originated in the 1970's as a small baitfish imitation. 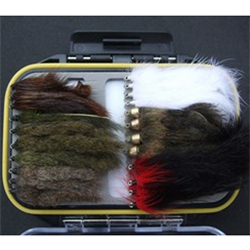 The wing of the fly is tied with rabbit fur instead of feathers and the result is a more durable, livelier swimmer that proves irresistible to predatory fish. Turrall Fly Pod Zonker Selection contains 22 flies in 6 patterns.